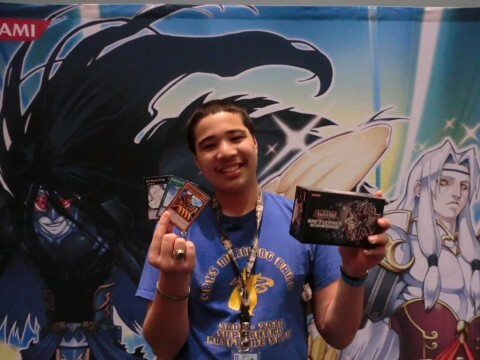 Jason Guerrero just came back as runner-up in our last Battle Pack Public Event. He gave us a few minutes of his time to tell us what he thought of sealed play, and of Battle Pack: Epic Dawn. Firstly, he said there was a lot of nostalgia, and that’s definitely true. It’s hard not to wax nostalgic when you destroy your opponent’s Jinzo with Raigeki! He thought it was very interesting to play in sealed events. He thought it was cool to see what other people pulled from their packs without asking – you just Duel them and find out! He was also happy with many of the reprints like Adreus, Keeper of Armageddon and Tour Guide From the Underworld, as well as the new Gem-Knight Pearl. Like many Duelists, Jason was unfamiliar with a lot of his cards. He had to read over Helping Robo for Combat, Possessed Dark Soul, Hyper Hammerhead, and DUCKER Mobile Cannon before he knew what they did.